Crossovers can be a dicey proposition. Whether in comic books, movies, television shows, or video games, they have an obvious business appeal: the potential to get fans of one series interested in another, and thus make more money. But creators are left with the problem of making characters from two worlds interact organically, and the challenge of bringing out the best in the combined cast. Plus, they have to make a new audience care. That’s the beauty of Persona Q: Shadow Of The Labyrinth, which fuses the Japanese role-playing games Persona 3, Persona 4, and Etrian Odyssey. The Persona series is driven by its characters and stories, while Etrian Odyssey is all about the details of its game design. (Only one version of the latter series even has a story mode.) Persona Q takes those fleshed-out characters and has them explore Etrian Odyssey-style dungeons, producing a game that’s both highly challenging and entertaining. Players have a choice to control either the main character of Persona 3 or 4 (although sadly, the female protagonist released for Persona 3 Portable isn’t an option). That might seem like a big decision, but about 12 hours into the game, the two games’ protagonists and their respective teams meet up, and players gain the ability to mix teams when building parties to go dungeon delving. One quirk is that whichever protagonist you didn’t choose at the beginning is freed from the restrictions of a silent hero, with plenty of voice-acted dialogue, so you might want to base your decision on which hero you’d prefer to be quiet. With time, we learn that both parties have been trapped in a strange version of Yasogami High School, the setting of Persona 4, and they can only free themselves by defeating the masters of four labyrinths. These labyrinths are complicated dungeons, all of them filled with secret passages, hidden treasures, and particularly powerful monsters called F.O.E.s that move in predictable patterns. To keep track of everything, you’ll need to use the 3DS touchpad to create a meticulous map. Inching through the dungeon can be a tedious process since the place is crawling with often-vicious random encounters. Thankfully, you also have a constant feeling of progress as your characters and their Personas (psychological Pokémon, essentially) gain strength. As in the Etrian Odyssey games, selling loot to vendors unlocks a steady stream of new gear. There are also items that can only be obtained through repeat visits to the labyrinth, like a plant you must water gradually to get it to grow into a flower for a magic ring. There’s a constant balancing act between risk and reward. Sometimes it manifests in simple ways: You could be asked whether you want to press your luck by tapping a resource node when there are monsters lurking nearby. Other times you face tougher decisions. When you’re drained after a tough fight, for instance, you might have to decide whether the best way to escape a labyrinth is to backtrack or to press forward in hope of finding a shortcut. Healing gets expensive fast, and if you get unlucky in combat, the loot you gain might not cover your costs. It’s often a good strategy to just bench a knocked-out character and fight with an alternate team to conserve resources. Unless you start playing on the highest difficulty, you can change the level of challenge any time you want, like when you need a break after your party is laid low a single fire-throwing beetle. 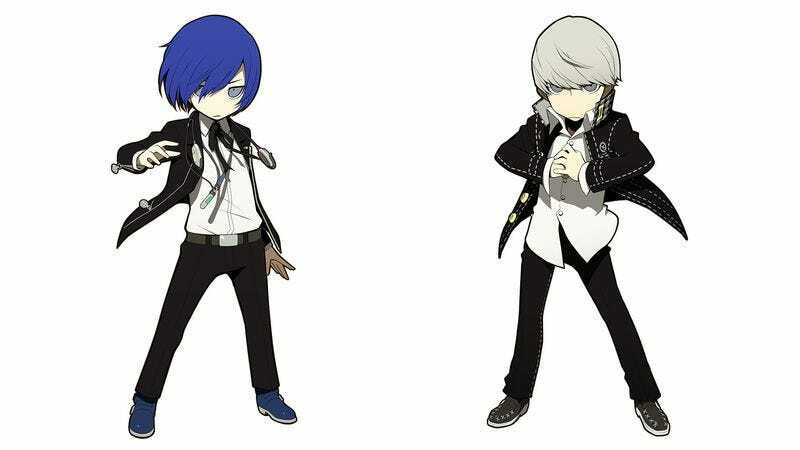 While in previous Persona games only the protagonists could change their powers, Persona Q gives each character a “sub-Persona” slot that provides them with a host of new powers depending on which sub-Persona they have equipped. Combined with the huge cast, this make your party extremely customizable. In Etrian Odyssey, some classes were weak in combat but provided vital passive powers that made you better at exploring and looting, forcing players to make tough choices when it came to party construction. Persona Q bypasses such dilemmas by using support characters that provide useful powers from outside the dungeon, so they don’t hold your squad back on the battlefield. Many crossovers have the problem of trying to get players to invest in characters they haven’t been exposed to before. You might think that Persona Q would face that problem less than most mash-ups since its characters are drawn from two games in the same series—but then there are the new playable characters introduced for Persona Q, who don’t do much to endear themselves. They’re both amnesiacs, and beyond that, Zen is pretty much defined by being overprotective of his companion Rei, a flighty, food-obsessed kid. They’re little more than plot devices. The game really opens up once the two parties connect and you’re given a variety of side quests ranging from the simple—like acquiring a particular type of Persona—to ridiculous—like finding a way to trade a pair of chopsticks for a massive parfait to please a girl. You can also go for “strolls” where you learn more about your companions. This is where the Persona side of the crossover does the heavy lifting. The game mostly caters to people who have already played both Persona 3 and 4 and want to spend more time with those characters. This is a massive game, so it’s lucky you have so many charming oddballs to spend it with, including a knife-wielding dog, a cross-dressing detective, a protein-obsessed jock, and a pervy guy in a teddy bear costume. Seeing how they interact both in and outside the dungeon is delightful. Sometimes hitting a dead end in the labyrinth will get some characters bickering, which is its own reward. Persona Q is fan service of the best kind wrapped around a meaty dungeon crawler. By understanding the strengths of both Persona and Etrian Odyssey, Atlus has created a game that can satisfy fans of either series, though Persona Q speaks most compellingly to those who have already played some of both.